The journal “Shaman” is published once a year, one volume, two numbers (Spring and Autumn) always bound in one. 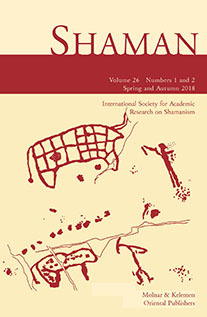 ISARS membership includes a printed copy of the journal SHAMAN sent to your postal address. To become a member of the ISARS, please sign up through our Membership page. Should you be interested only in purchasing a copy of the journal (without become an ISARS active member), please contact the publisher at molnar@folkscene.hu. Please note that for new subscribers there is a special offer for a complete set of BACK COPIES (Vols. 1-23 or 1993-2015) that we stock in a limited number. The price of the complete set is EUR 460 + EUR 42 for postage and packing.